By buying this product you can collect up to 32 loyalty points. Your cart will total 32 points that can be converted into a voucher of Rs. 3.20. 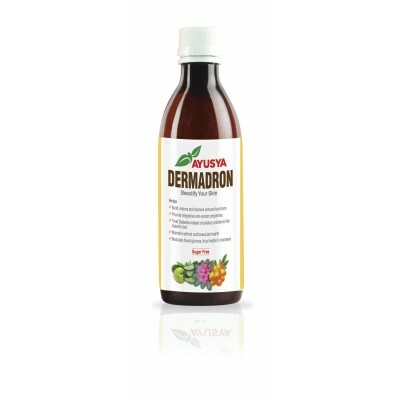 Our clients can avail from us Dermadron Juice which build, restore and improve immune functions. Processed using pure quality chemicals and ingredients, these are highly acknowledged for their precise composition, usefulness, long shelf life, purity and no side effect. In addition, our offered syrups are quality tested and are presented in diverse quantities that clients can avail at market leading prices. Composition:Each 100 ml contains Sea Buckthorn 40 ml, Rhododendron arboreum flower extract 20 ml, Amla 20 ml, Aloe Vera 20 ml. A Flower and fruit juice which takes care of your skin and keeps your body beautiful and for any kind of skin problems. Dosage:10 ml twice a day after lunch and after dinner.